Picture In Blogger Header | Update. ~ The Blog Doctor. You are here: Home > Picture in Header > Picture In Blogger Header | Update. Picture In Blogger Header | Update. The new Blogger introduced the graphical interface for editing your template. 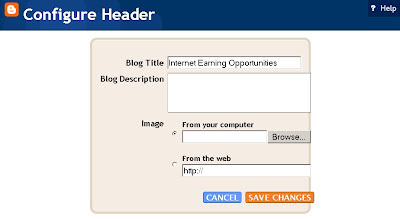 Instead of going into Template------>Edit Html as in old Blogger it introduced a 'Layout' link on the Dashboard itself. So all you have to do is to login to dashboard and click on Layout link and you will be taken straight to the Page Elements tab. The Page Elements tab is a new subtab of the Templates tab where you can add new page elements. There are some 14 types of Page Elements which you can add to various sections of your blog. Automatically add current headlines from Google News to your blog. Display clips from YouTube and Google Video for your readers to watch without leaving the page. Add a list of your favorite books, movies, or anything you like. Add a collection of your favorite sites, blogs, or web pages. Add a picture from your computer or from somewhere else on the web. Add some words to your blog - like a welcome message - with our rich text editor. Add content from a site feed to your blog. Show all the labels of posts in your blog. Choose from a variety of Blogger logos to add to your page. Display links to older posts. Display your blog's title and description. NOTE : When you upload a new template to your blog the code for the Page Elements is added but they are empty and you have to add the data later. Also when you backup the template the content in the page elements is not saved along with the template. You have to backup the Page Elements data separately. 27 VIEWERS CLICKED HERE TO COMMENT ON THIS POST. ADD YOUR COMMENT. I think I'm using an older version of blogger. I tried to follow the instructions on removing the no follow tag and discovered that the code was written differently and the tabs you spoke of in the template section of the dashboard weren't there. I still found that no follow tag, though, and took it out! I've been afraid to hit that "customize" link for a new template because it warns you could lose some changes. I'm technologically useless and it takes me forever to do anything, so I'm loathe to lose anything. Do you have a blog post related to making that change without losing stuff? Your blog has been approved. Please add a link back to enewss.com with title 'Indian blogs' and anchor "Indian blog aggregator"
What if you want to use a flash movie in the header. Does blogger support that. I love the Loneley Tree one on this blog & have been wondering how to do it. i have used pictures header before accroding to your old post. and if i want to have two header pictures is this ok ? can i use both or i have to delete old header picture. Click the link "Many Headers -One Blog" under 'PICTURE IN HEADER SERIES' at the end of the above post. This is great, I hadn't seen it! But I'm wondering if the image must be of the exact dimension of the header, which I can't find (I'm using a rounders 3 template). P.D: Very useful guide, there’s so much to discover! I just uploaded a different picture onto my header and I can't find the buttons to adjust the placement of the blog descript and formatting the size of the actual picture. I've tried resizing, playing in editing the html and all that stuff, but I'm having no luck. great site. it's been really helpful. i'm having same problem as AWE i think. i've switched from picture as a page element below the header page element to a pic behind titles in header. worked fine except there is no shrink to fit function. i have tried changing size of pic before uploading but it isn't making any differece once i add it to the page element. i want the pic flush, as you can see, it's overhanging on the right hand side. so, advice on shrink to fitting it would be appreciated. I see the picture correctly fitting in Firefox2. Help! I'm a new blogger and I am confused. I want to add a photo to my blog - i went through the steps to elements, etc. The area where you click on browse to add a photo from your computer does not have a browse button. It only has a horizontal scroll bar! What do I do?? my email is clutterbugstudio at comcast dot net - my blog site is clutterbugstudio dot blogspot dot com - if that helps any. How can i make my header's picture shrink to fit when i minimize my IE browser? currently when i minimize my browser, the border of the header is auto fit to IE size, but my picture is not. Hi thanks for the guide, i did everything, except when it came to uploading the picture, i chose upload from the web and then pasted the url I got from picasa, when I clicked on save changes, a triangular sign came out which said please specify an image. What am i doing wrong? Try uploading picture to Photobucket.com and pasting the url you get from there. I have played around with this all darned day and I still cannot get my photo to be as big as the title box. hope you are still answering questions on this thread! I am using the Stretch Demin template and trying to add a picture to the header, but with size (width) is a problem. I want the picture to be the same width as the blog itself, but can't seem to accomplish that. I get it sized right in one browser and it looks wrong in another. Can I fix the width? Oh and if I use the "shrink to fit" the picture is smaller than I want. See how to center header in stretch template. Vin--must be I am just slow--my picture was too wide for the header--adding this code didn't seem to impact it at all. So I reloaded it using the shrink to fit and your does did center it, but then when I went to increase pixel size it just moved it tot he left. Is it that I need to be starting with a certain size picture for this template? If so, how do I determine the right size? Thanks again so much. Vin--ignore last question--figured it out with help from another of your pages--thanks! Hope you're still answering on this. I've created a picture to use for my header but it's not showing up. I've tried from my pc or from flikr and it's not working. I've tried different sizes and it doesn't work either. Not sure why it's not showing up. I'm using the minima template. Here's my blog http://noniewooley.blogspot.com/ I've also tried deleting all my cookies and stuff and that didn't help either. HELP!!! I'm so frustrated!!! Try adding picture as a background image to header in the CSS. You have to delete the code in the CSS which is responsible for the corner graphics in the Rounders template. Have a look at it in The Three Column Rounders Template. Hello vin, hope you see this... im having a problem with this on my blog i just create it. i upload the image in the header section and i save it, but in the blog never appear the image in the header, i clear the cockies etc but nothing, its a posibility that its a way to fix that without coding or edit the code? thanks... and sorry for my bad english. Try this method of adding image to header in CSS.